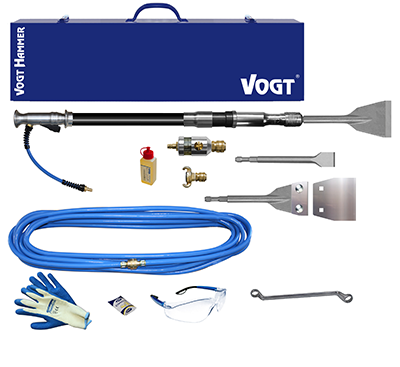 The smaller VOGT Breaker VH30 has only half the weight of comparable electric hammers, which simplifies over-head-work. The VH30-70 already reaches the complete storey height without scaffold and planks. 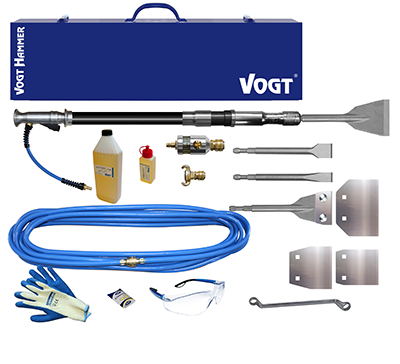 The higher impact frequency of the VH30 is ideal for brittle materials: epoxy resin, plasters, filler, thin tiles, tile adhesive, residues of mortar and concrete. The small hammer mechanism is content with 190 litre per minute. The VH60 is one size bigger: its stronger piston is appropriate for ductile, compact mate-rials: bitumen, cement, plaster and brickwork. Even extremely ductile parquet adhesives do not resist the strong hammer mechanism. 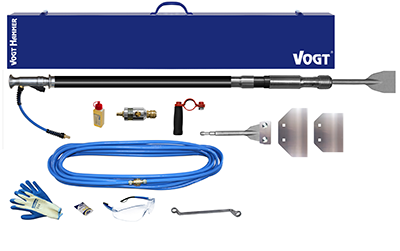 With its 18 mm tool strong leverage force can be applied during undermining works or when flat roof seals are broken up.